The name Whaly is not too exciting, but it is the one owned by perhaps the most accomplished of 12 footers: the Whaly 370. As the number suggests there are Whalys of other lengths, all of similar layout. The form resembles a RIB but built of double skinned UV stabilized polyethylene – what used to be contemptuously described as a Tupperware boat. This of course is an insult to Tupperware, an enduringly tough product, but a left-handed compliment to the boats that have an indefinitely long, fatigue-free life ahead of them. This material has many attractive qualities for a tender. Its yielding, slippery nature makes it kind to unskilled contact with the mother ship’s hull. It also renders it near immune to damage from vigorous encounters with jetties. The 370 in particular is a born tender. Within its small footprint it has the European certified (Whalys are built in the Netherlands) carrying capacity of eight persons or 550 kilos. 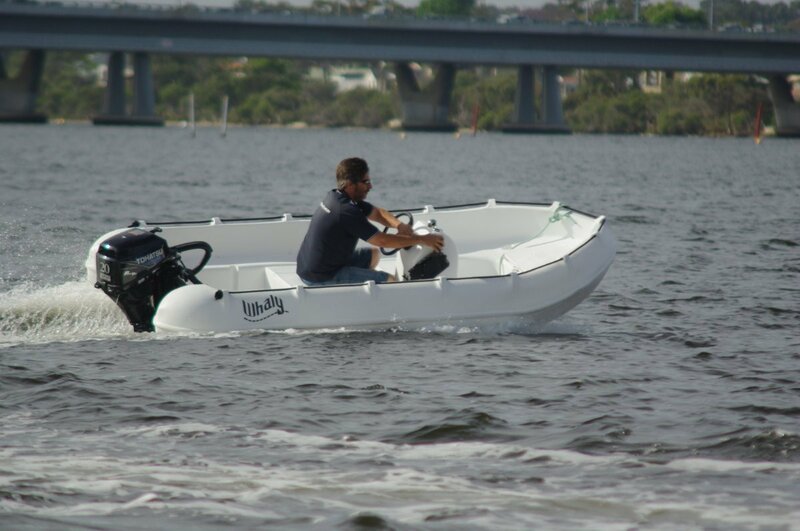 All the Whalys are built to suit fitting out as tiller steered or side console wheel control. They feature full length buoyant side chamber-benches for maximum passenger numbers with tiller control, simply convertible to wheel steering with drop-in units. The side chambers have vertical grooves to accept them. The review wheel-steered 370 has two of these drop-ins; one provides the thwart-locker the driver sits on, another the combined partial thwart-console. It is more of an off-centre than side console, since it has to fit within the side benches, but it still provides the maximum of rail access for anglers. And, putting weight a bit closer to the centre line, it aids balance. The console has room for fishing electronics, but in its basic form it does not have as much as a rev counter or trim gauge. This is exactly the case as with tiller steered boats, and is a perfectly acceptable simplification bearing in mind the basic tender role. Tenders of this size generally have gear scattered throughout but the 370 is a model of neatness. Battery and fuel tank live in the thwart-lockers while the lidded anchor well is big enough to take extra gear as well as the anchor cable. Whaly even provides drink holders for the passengers. It also gives them a stronger feeling of security than most comparable RIBs. Typically the grab lines are loops hanging over the side, but not on the Whaly. Here a taught line is stretched on top of the tubes from quarter to quarter via the bow, supported by frequent mounts. The kind of line you want and where you want it. The recommended maximum power for the 370 is 20hp. This is what the review boat was equipped with, provided by a Tohatsu four-stroke. Many people have only vaguely heard of the make; those more familiar with it have mostly believed it to be purely a two-stroke. Certainly it makes a lot of two-strokes, possibly more than anyone else. Vast numbers of small scale fishermen around the world buy them, and have been doing it for a long time. Tohatsu is Japan’s longest established outboard manufacturer. Tohatsu also builds a wide range of four-strokes that emphasise the qualities of their two-strokes: near unburstability, simpler service requirements and lower prices; attractive qualities. Our Tohatsu practically converted the 370 into a sports boat. Two-up it was a vibrant performer, indicating that with a full load it would still be far from sluggish. Although the Whaly’s key employment is likely to be ship to shore transport, its carrying capacity, stability and good ride fit it for the other traditional Rottnest role: the fishing boat-dive tender. Not so much an all-rounder as a maid of all work.